Now that I had a technique for making teeth, it was time to do some mass production. The picture above is of 28 teeth: formed, sanded, smoothed, gessoed, base coated and first layer of distressing applied. I want the teeth to look old so I have been investigating how to distress them. I still need a few more layers to build up the antiquing look. And this is ONLY the lower jaw. I still have another 28 to make for the top. When I started into paper mache I tried several types of glue but quickly choose traditional white resin glue as my favourite. I surfed for more details but one question intrigued me: white vs wood glue. 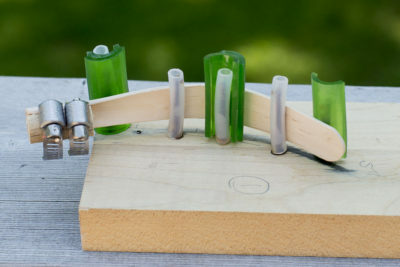 For my work I use three glues. 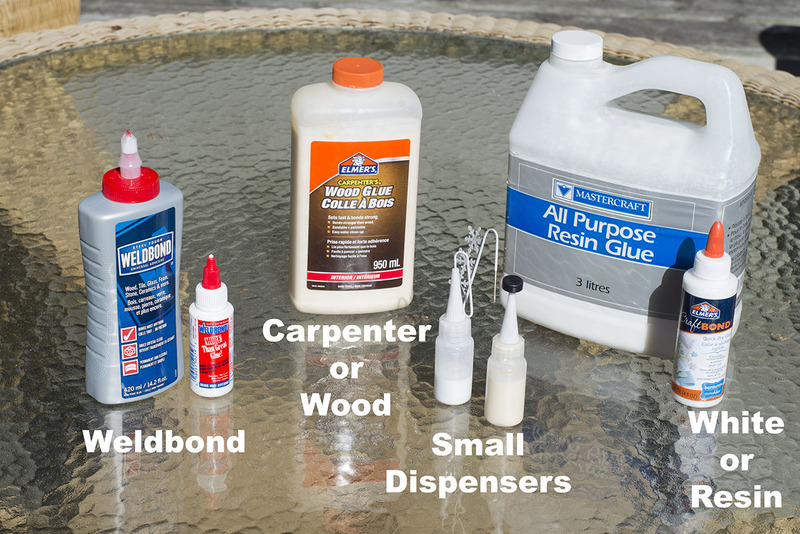 Other than Weldbond, I tend to use generic or house brands of white and carpenter’s glue. 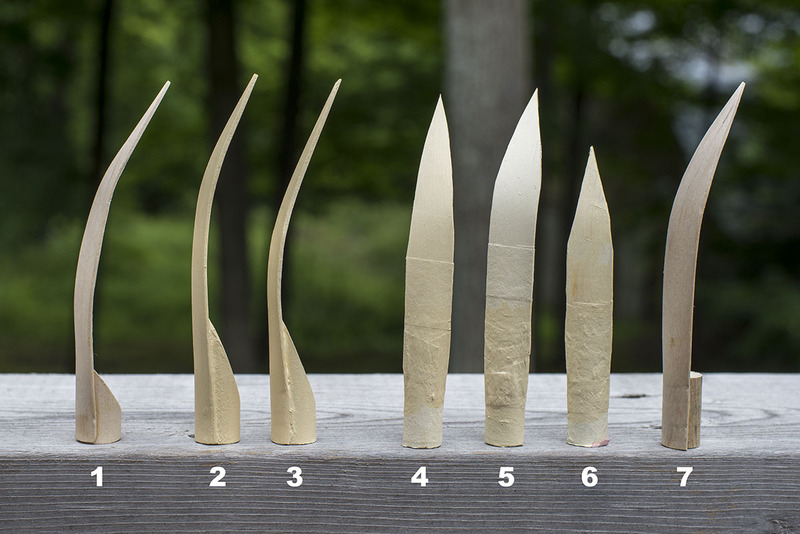 Here are my observations of each as it pertains to paper mache. First thing I learned is all white glues are not the same. Some are thicker and made to grab and dry faster. For paper mache you want the basic white glue. I buy it in three litre jugs and fill smaller dispensers. In the image above, the left dispenser with the crazy top is white glue, the right is carpenter glue. I found a four pack of these pictured small squeeze bottles in an art store. I drill a hole in the top then make come sort of cap. Then I fill them as needed. The small bottle of white glue called “Craft Glue” is an example of a thicker, faster drying glue. I found it too thick for most of my work and tough to control the flow of glue when dispersing in a thin line. For paper mache glue I use a latch bail jar. Easy to mix up a new batch (90% white glue, 10% water), quick to open and close. 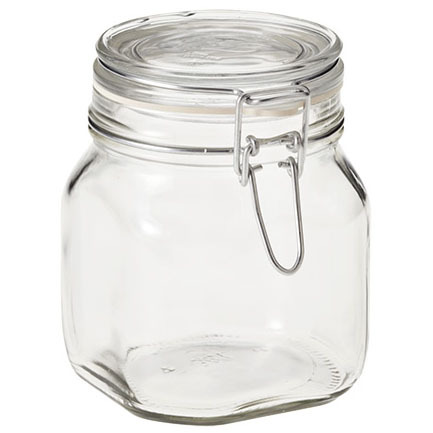 It is important to keep the jar closed when not using it to avoid dried chunks. I usually apply my glue with long flat brushes. Let’s walk through the three for strengths and weaknesses. Mixes with water for paper mache. I run 10-25% water depending on what I am doing. 10% water is my most common recipe. NOT SANDABLE. Clogs up the sand paper. Will not chip. Of you have a drip or clump off of the side it is not easy to break off. Softens when exposed to water. NOT flexible. It cracks when bent. Chips off if you have drips off to the side. 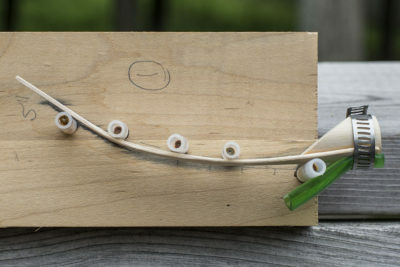 I use when gluing wood parts together such as a tongue depressor to a dowel. The drips out the side chip off easily and you can sand the edges of the bond. Great for gluing an object to paper mache. Dries fast, strong bond. So what’s the best glue for paper mache? For me it is all of them. They each have a purpose. 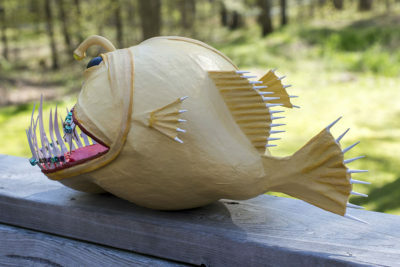 Not that I had a technique for making teeth, it was time to make some and try them on the jaw. 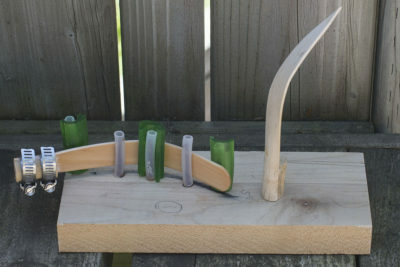 I created nine teeth and attached a short length of bamboo skewer to the bottom. This will serve as the root when putting them into the jar as well as a way to stand them up while painting. I took a board and just drilled a few rows of holes. Piece of bamboo skewer inserted into the bottom of a tooth. 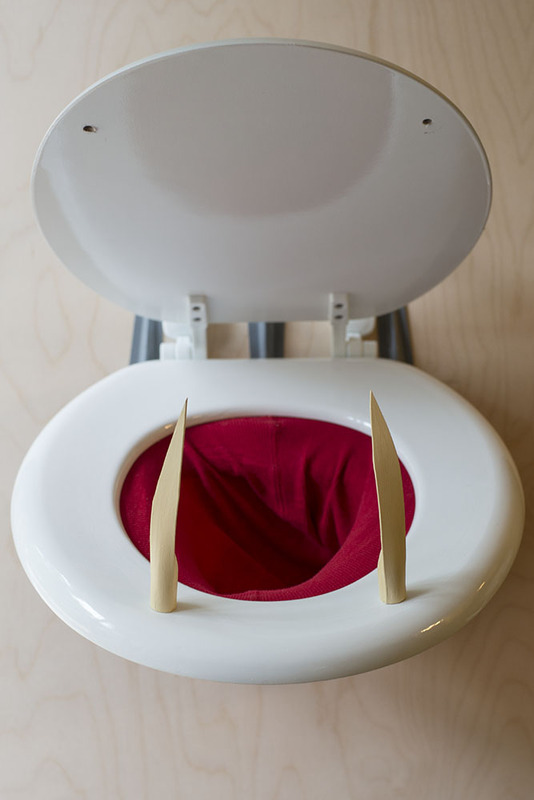 Here are front and side views of the seat with the teeth inserted in. 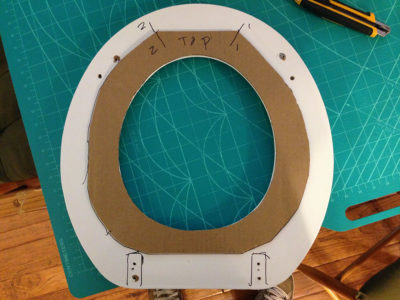 The toilet seat needed to be sanded. 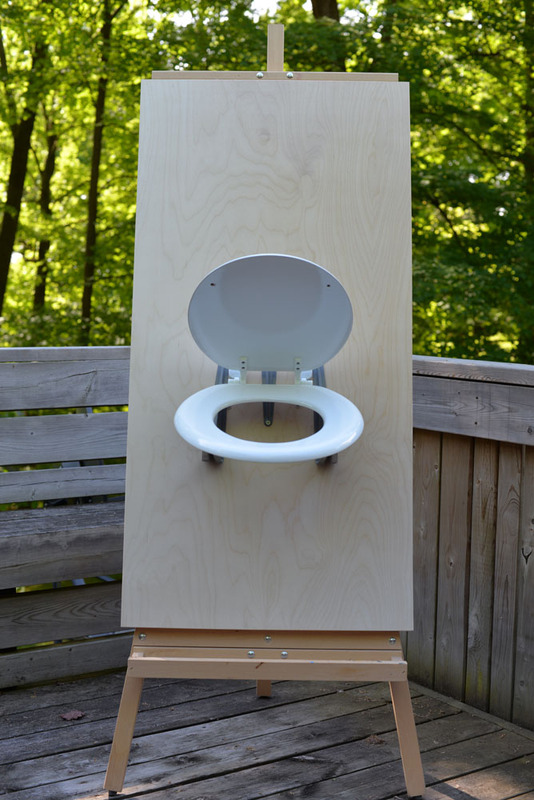 The finish is designed to resist staining so it also resists paints and glue. 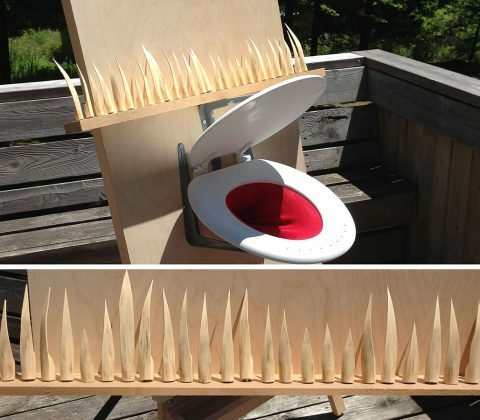 I wish I had sanded the seat before attaching anything like the gullet. Removing 8 screws and the two parts would have been free and easier to work on. Next time I am going to drill into the base of the tooth with a drill press to make the hole centred and straight. It is hard to hand drill into them. The depressors sitting in water last about 3 days then they start to fall apart. Now that I see how they work, I will start on the side ones shortening them towards the back of the jaw. 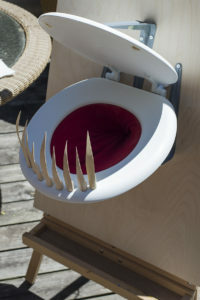 After much experimenting I have come up with the approach I am using for Pottie Mouth's teeth. As I learn more I will modify this post to reflect what I learn. Soak a few depressors overnight in water Jun 17 - I tried just boiling dry depressors and it worked fine so I no longer presoak. BOIL them in water for 5 minutes - What I do is put the depressors in a pot with water. Then I bring it to a full rolling boil and turn the burner off. Then I let it sit for 10 minutes. Return them to the jar with water. Remove one from the water and towel dry the surface. 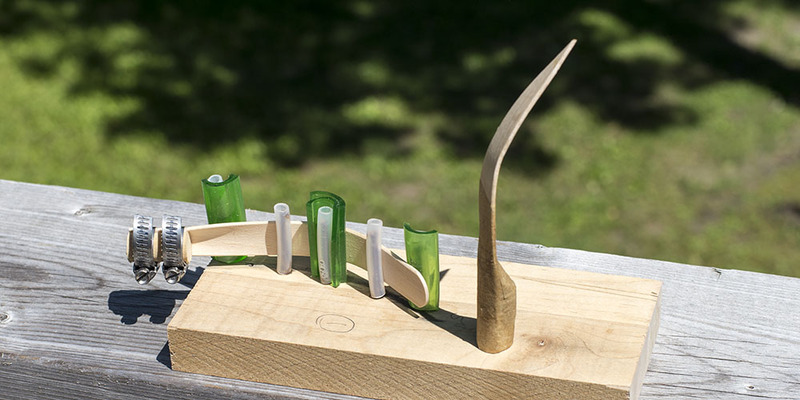 Place a piece of wet tongue depressor below between the clamp and the tooth. This acts as a guard against the clamp marking the tooth. June 15. I love tuning a process as I work. Today I decided to use an end of wet tongue depressor to protect the tooth from the clamp. I added step 10 to put a piece of wet depressor between the clamp and the tooth. I also predrilled the dowel so that I can arrange them on my tooth stand. 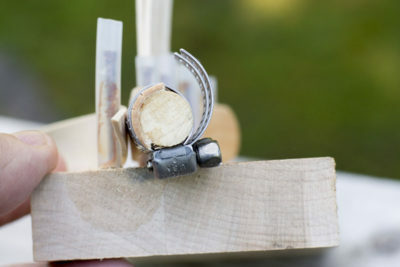 Using a piece of cut off depressor end to protect the tooth from the clamp. I made several variations of teeth. Here are some of them. 7 - This is one of the originals. Note the use of a square cut 1/2" dowel and marks on the face from the hose clamps. 6, 5, 4 - These show the tooth front of variations on 7 where I tried building a transition on the back with paper mache. The problem is the paper on the front hurts the appearance of the tooth. The backs shown below aren't very appealing either. 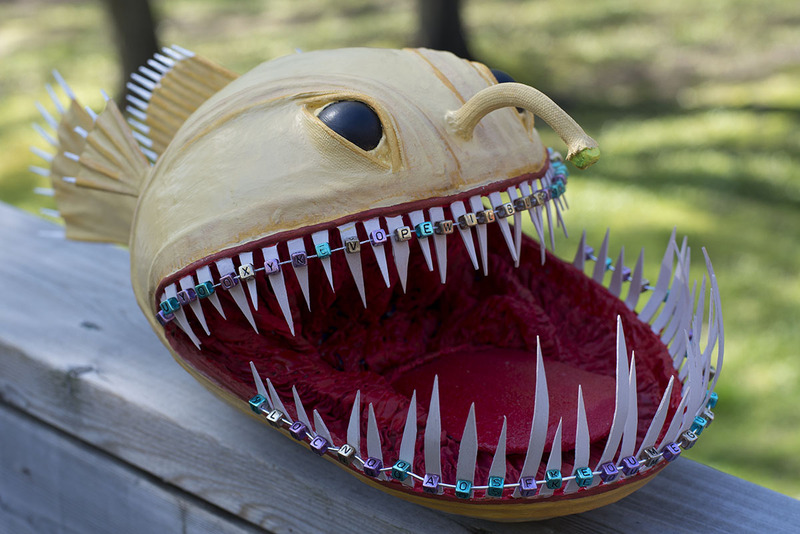 Here are the final teeth in side and front view. 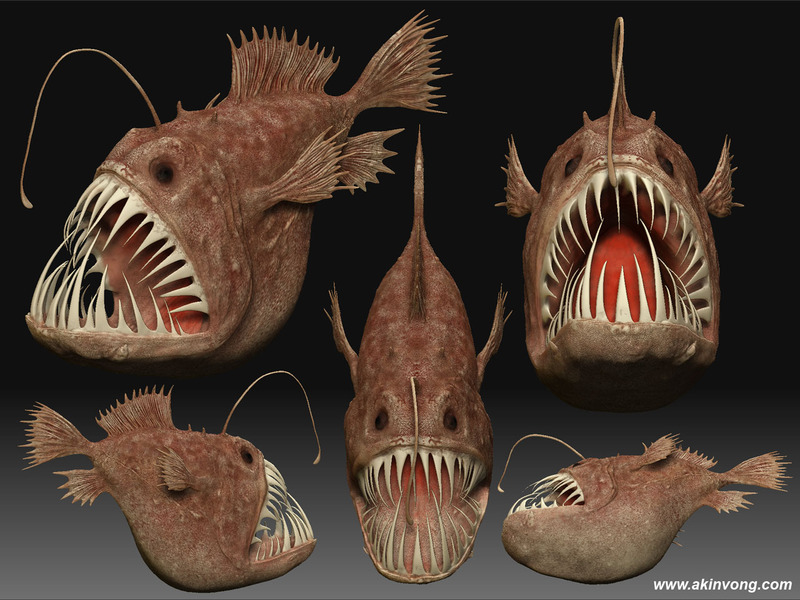 Final teeth in front and side views. Next technique to develop is creating the teeth. 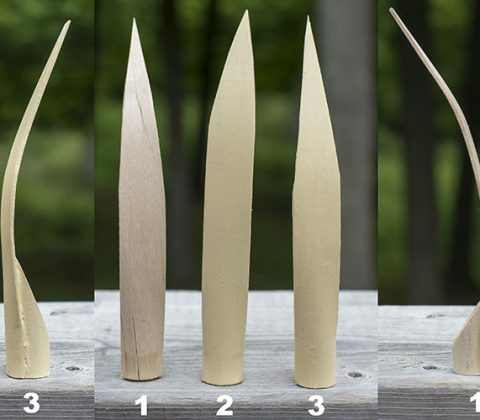 In Wilburine, I worked out an approach of bending wet wood coffee stir sticks. For Pottie Mouth, I need much larger teeth. Coffee stirs would be too thin. I decided to use 3/4" x 6" tongue depressors. A box of 500 unsterilized sticks was $9. 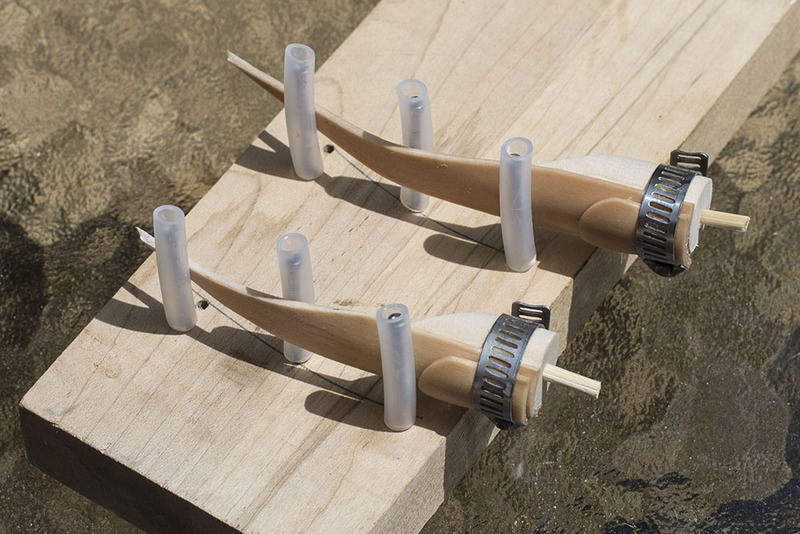 They are hard wood, and when, soaked in water become pliable. 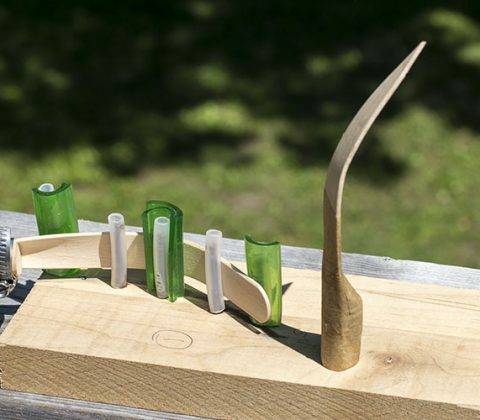 Using nails on wood, I could bend them, but this still creates a flat tooth. I call my next idea a "Monster Tooth Maker." I modified the jig setup from Wilburine. 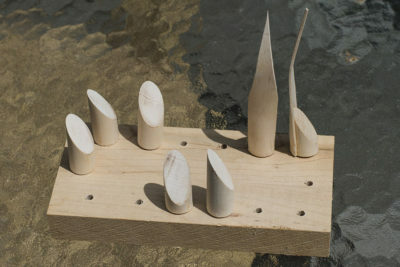 First, I used finishing nails and drilled holes just a tiny bit smaller with a drill press and then pressed in the nails. This gave me perfectly vertical nails. I put some tubing over them, as finishing nails are steel and leave a rust spot on the depressor. As I tried making teeth, it became apparent that the end needed to be rounded. To create the round effect, I bought some 1/2" copper plumbing fittings and 1" hose clamps. Then I found some 1/2" dowel. Now instead of the copper fitting, I used a short length of dowel as the core with two host clamps. I also cut up some split vinyl tubing to use as shims to tune the bending. 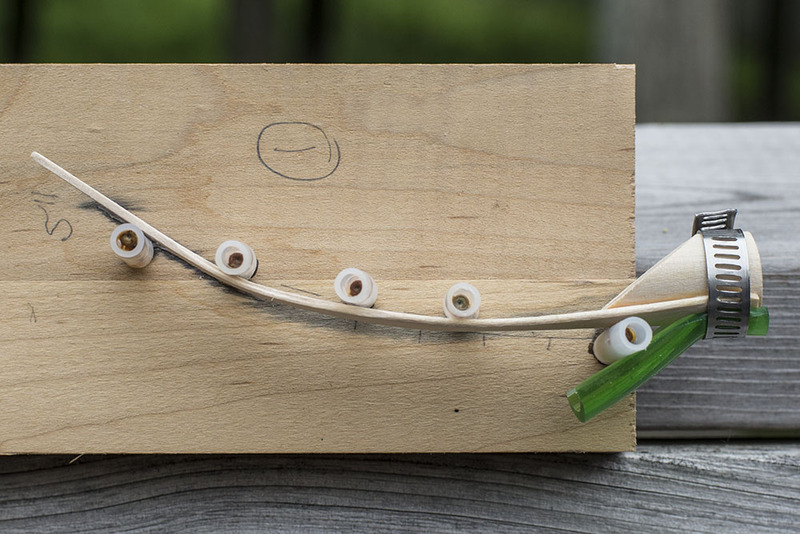 Be sure to towel dry the tongue depressor where you are adding glue for the dowel to avoid thinning the glue. My intent is to paper mache over the base of the tooth once formed to give a solid shape. 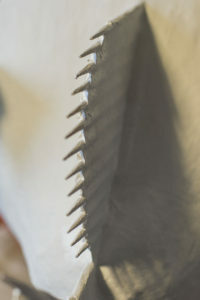 Once dry, the ends can be cut into a point for the tooth top. It is better to cut the bottom before drying, as the curved wood tends to split when cut curved and dry. 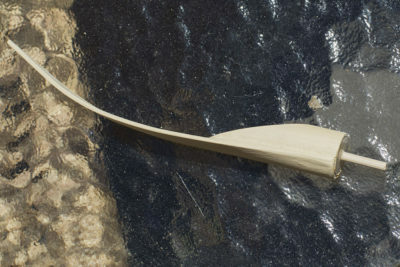 This image is of a dried tongue depressor, glued to the dowel, bent into shape and cut to form the point. The surface is raw, but a thin layer of paper towel paper mache will fill in the back, as well as smooth the surface. 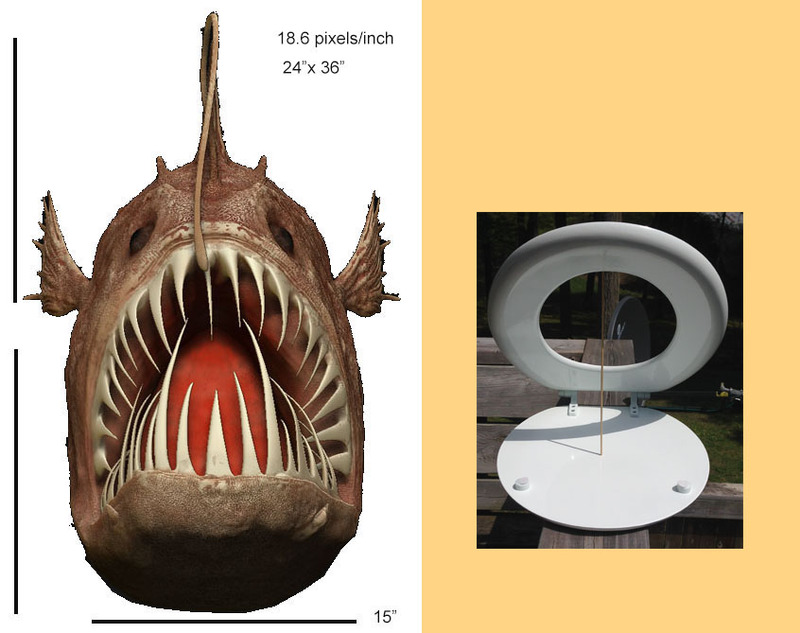 The top image is of the jig with a finished tooth, including a thin layer of kraft paper towel mache to smooth out the transition. This is the maximum full-sized tongue depressor sitting on the lower jaw of the toilet seat. This would be suitable for the fangs, but most will be shorter. Once I have several formed teeth, I will work on the paper mache layer. The past two weeks have been consumed with attempting a repair on my computer, ordering a new one, waiting then rebuilding from backup and getting everything to work again. Fun wow! 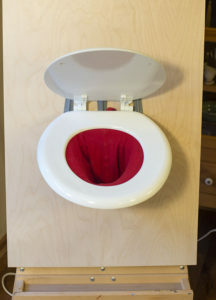 Today I got back to “Pottie Mouth.” I did some cleanup on the bracing and removed the bottom seat to install the gullet. A trip to a used clothing store yielded a little girls red stretch tube top. This will be turned inside out and installed as the gullet/throat. 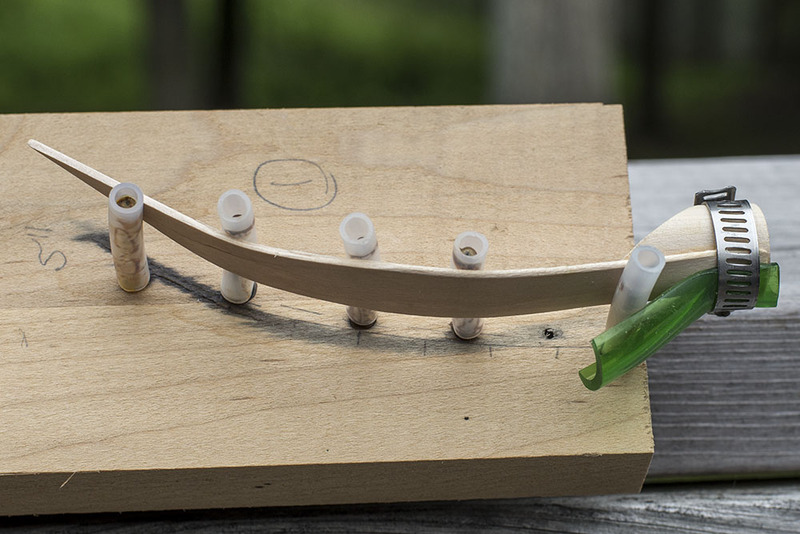 This first required building a template to mount the top on then glue to the bottom of the seat. 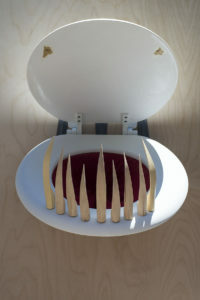 The seat was removed, a tracing of the seat inside made on the cardboard and then cut out. The tube top was stretched over the cardboard frame then placed on the seat bottom and glued in place. I rested heavy books on it to press it in place. The gullet (red tube top) is glued in place. The bottom will be secured to create a more direct path. 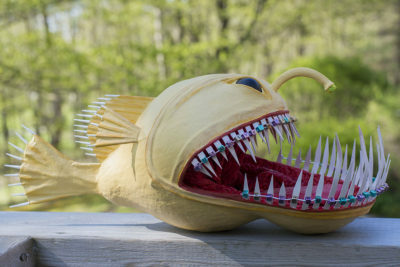 Now that Wilburine is done it is time to start working on my next fish. 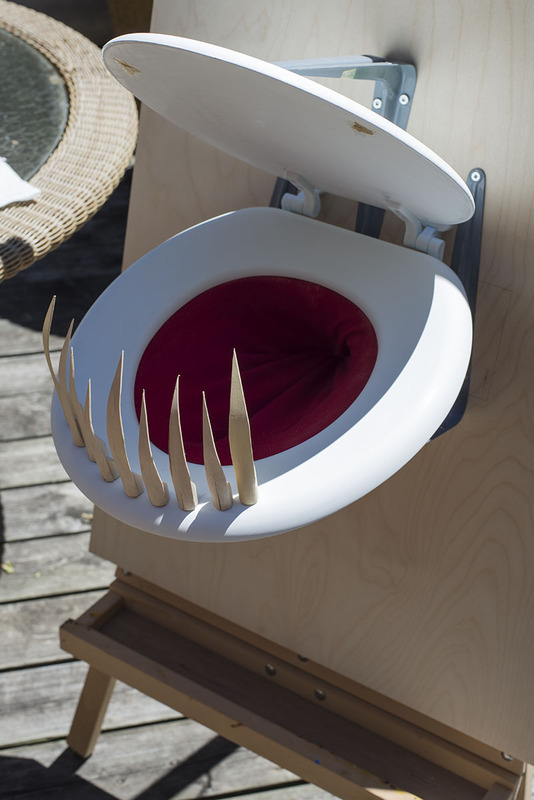 On Facebook a after seeing my work, a friend shared a video of a shark toilet seat. This is the video that inspired me to create my toilet seat fish. While I am not an air brush person, I loved the idea. 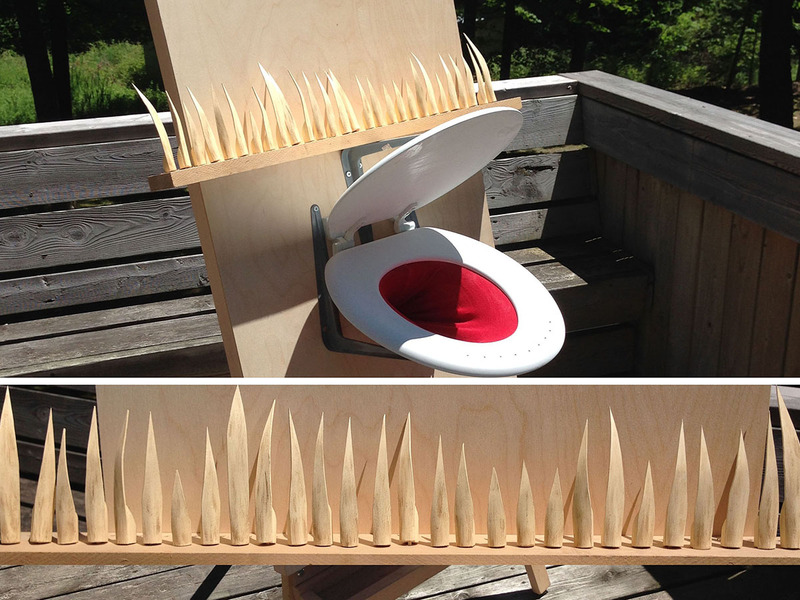 Off to the store to buy a wood toilet seat. Here is the original image from Akin Vong that was one of my inspirations for Wilburine. 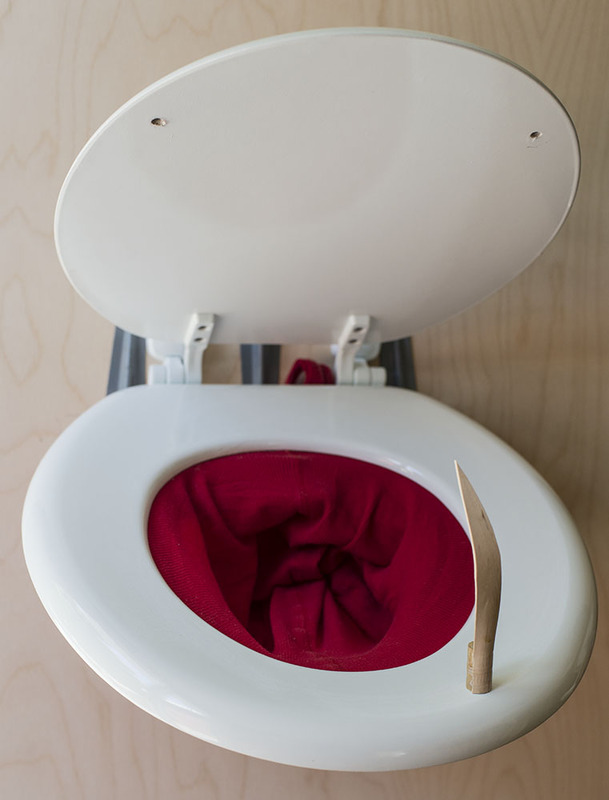 I took photos of the toilet seat and played with photoshop. Today I bought a 2x4' wood panel, braced the back and mounted the seat. The braces will be hidden in the head. One change from the original idea was to place the seat in the normal orientation with the hole on the bottom. 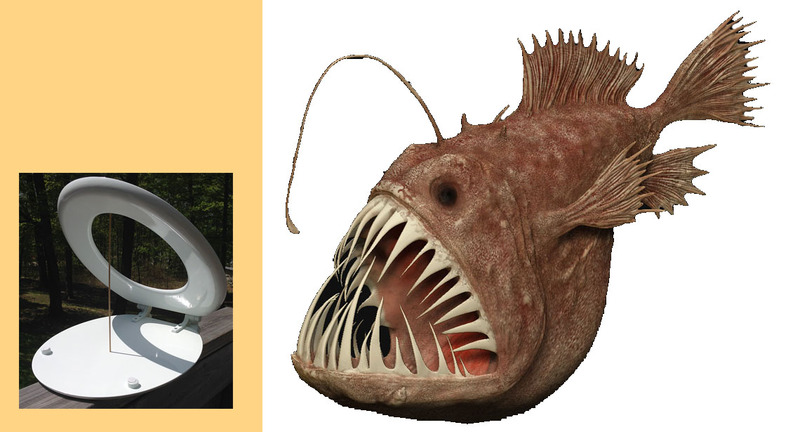 I am not sure exactly what fish I will base this on but many have the entrance to the gullet on the lower jaw. 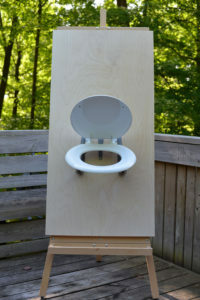 It became apparent that handling a 2x4' panel with a six pound toilet seat is a challenge. I found an old student grade easel and mounted the panel to it. The bottom tray is removable once completed. The panel is screwed on but could be removed. 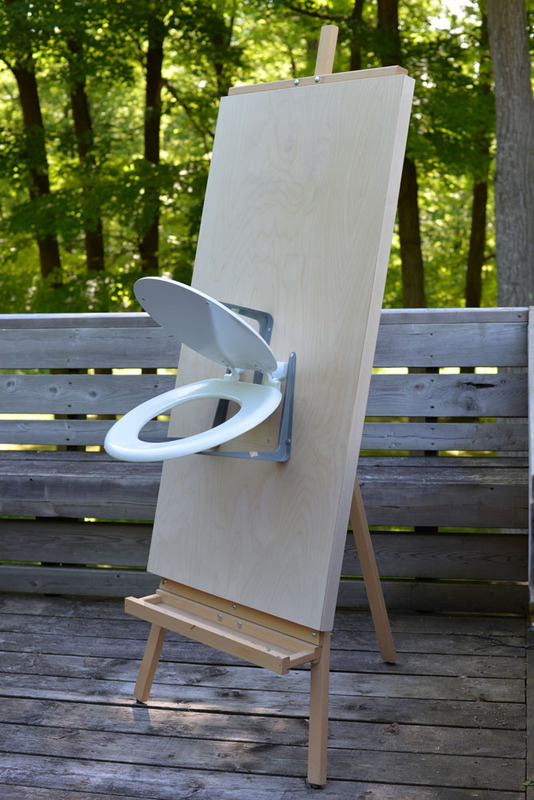 The funny part is the panel costs more than the easel. Front view - looking down the throat. Panel mounted on the easel showing the hardware details. 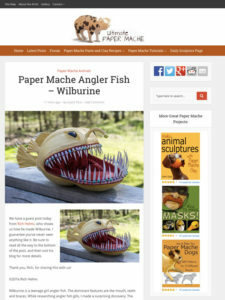 Two of my favourite websites for information on how to paper mache have included Wilburine. 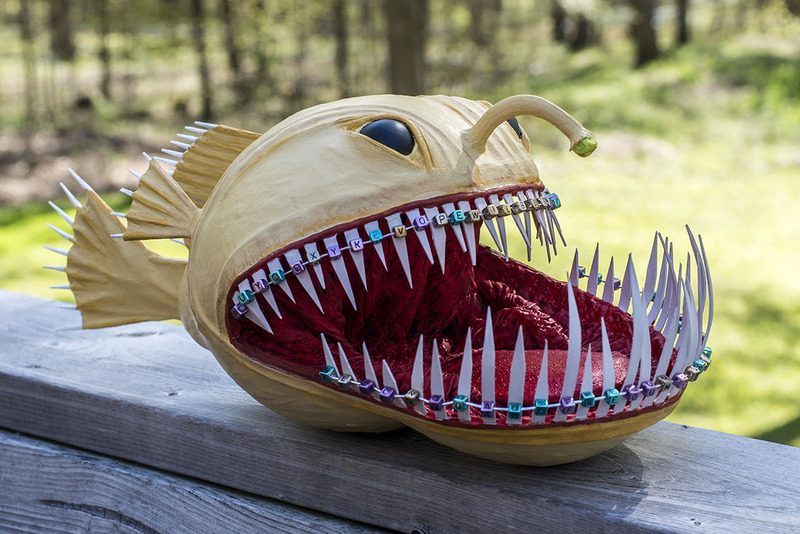 Dan (the monster-man) Reeder is a premier maker of paper mache dragons. Dan has written several books and his blog is one of the go-to places on the web for ideas and techniques. 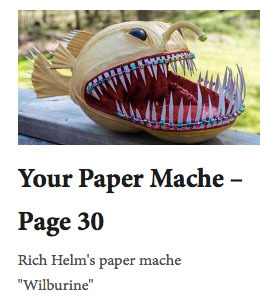 In Your Paper Mache page 30, Dan includes Wilburine. 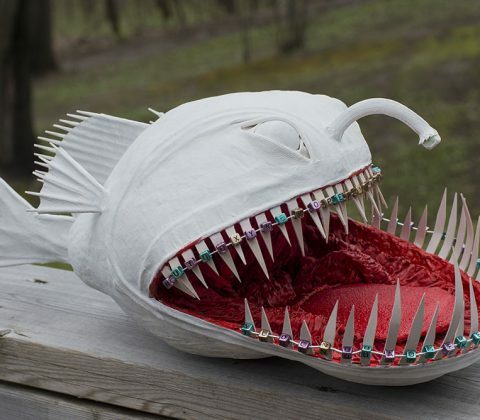 Another favourite is Ultimate Paper Mache by Jonni Good. 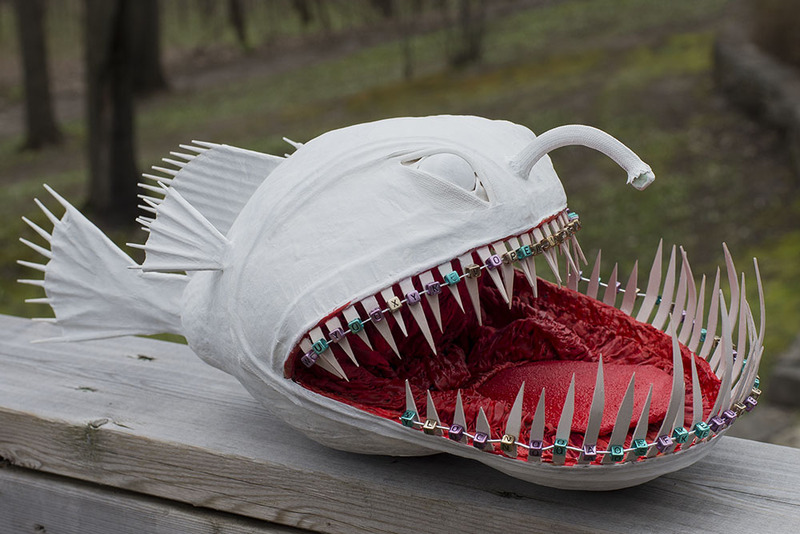 This is a source of recipes and tip on other approaches to paper mache. This site is where I got the idea to mix egg carton pulp with acrylic paint to make a rough filler for the edge of the mount inside. I wrote a guest post for Jonni on the making of Wilburine. They are both rich sources of ideas and techniques. Thanks Dan and Jonni. After just over two months work, Wilburine is finished. The past week has been very busy for me so she had to wait. 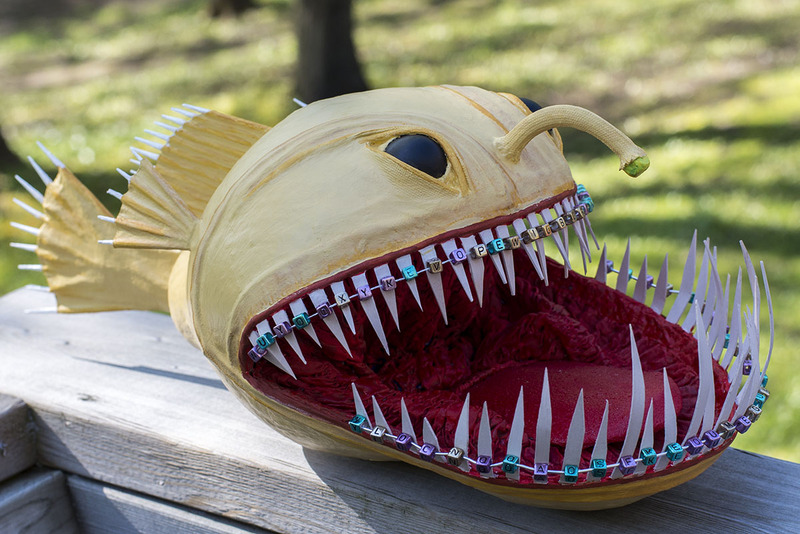 Angler fish are not visually very exciting so the paint job is basic. I used Naples Yellow for the base with touches of yellow and red oxide. 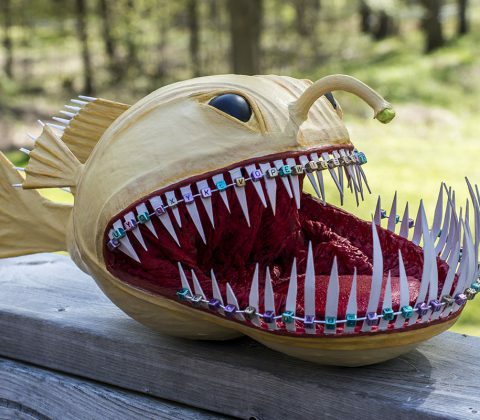 The inside of the mouth is several reds. I added titanium white to the spines to make them stand out as more dangerous. The story on the braces is funny. 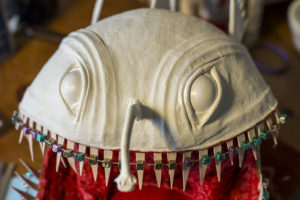 After creating the top teeth, a friend on Facebook commented that she needed braces. I thought support she (actually he at the time but that is another story) was a teenager and needed braces, not to straighten but to make them more crooked. Adding the braces was an interesting challenge. I learned so much creating her. Now on to the next model. Not sure what it will be. 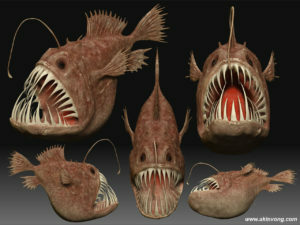 I have been studying several fish including frogfish. There were two websites that inspired me. What surprised me was the variety of materials and glues available as well a paper mache clay. List of the posts about constructing Wilburine. Here are the final shots of Wilburine. Wilburine has a coat of Gesso now. This creates the blank canvas on which I can now start the fine details work, as well as painting. 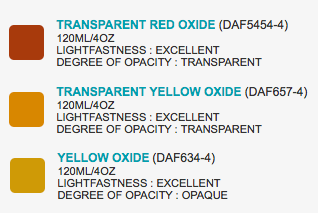 I am working on a "brown with red oxide, yellow oxide and accents in red" colour scheme. The coat of gesso gives a good base for paint as well as highlighting areas of fine tuning needed. In the top image, you can see small gaps around the eye where lids do not exactly meet the eye. 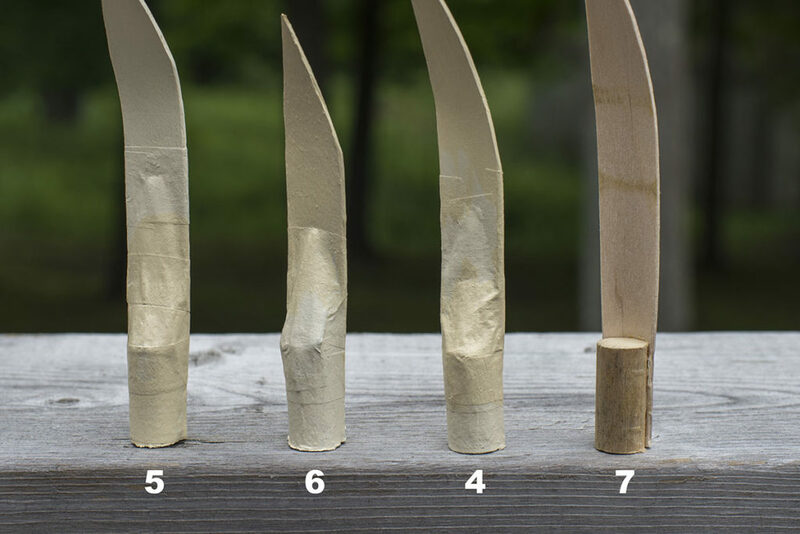 The other area needing touching up is the end of fins where gaps in the two sides of paper around skewers are. I use an artist grade titanium white for two reasons. The paint is thick so I can fill in small gaps. One thing I learned when painting Wilburine was that paint applied over gesso looks different than applied over titanium white. The gesso gives a flatter finish to the final paint, the titanium gives more of a gloss. One tip is to apply a final coat of gesso over the titanium white when it is dry so that you have a consistent finish to paint over. The images below show the eyes and fin ends after touchup. Now it is time to start applying colour. Tiny gaps around the eyes are filled in. 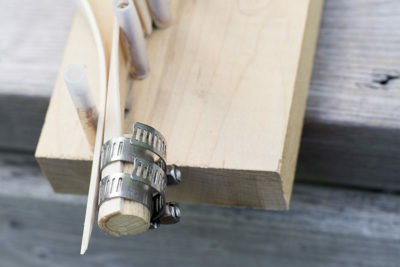 The gaps between the skewers and the two paper sides are filled. Screen colours do no justice but I am leaning toward browns and yellows with red oxide tones.